You see your father coming home late today. His shoulders drooped and forehead sweating profusely. Instead of coming home to lap food he chooses to plant himself in front of the laptop and resumes his office work. On the other hand, you witness you neighbor, who is more aged than your father, and relatively in a lower position than your daddy moreover he earns enough to buy luxuries for his living and yet finds him chilled and happy. What did you confer from these two situations? How you defined stress then and now should now have been changed by contemplating on these two scenarios? Ideally, a person working at a lower level (Your uncle) in an industry should obviously encounter stress often as he is being shadowed and interrogated frequently by his boss and boss’s boss. Whereas the one who is comparatively at a higher position (Your Dad) should enjoy the perks of getting paid more. This is the context that we have defined for stress until now, isn’t it? There have always been talks amongst elders where they specifically mention government postings as the only stress-free jobs left in our country and on the other hand while traveling you visualize government contractors toiling hard on the railway tracks and roads to meet deadlines targeting the upcoming elections. The definition of stress now seems to be more complicated and confusing than before, doesn’t it? To redefine stress, it never existed in any case or situation. It was in fact created by you and the way you work. It is never the content of your life but the context due to which you experience stress in variations. There are many instances in which we can justify how stress is not related to your work. Like in the above scenario clearly work never mattered for stress levels of both the individuals. What really accounted was how both the individuals looked upon their work as. One seemed to enjoy his work while the other took it as an unwanted responsibility, unwillingness to enjoy its purpose and as a result, failed to accomplish it which in turn developed pressure from all ends in his professional environment and that also affected his personal life. Be it the work of any level, from studying to pursuing masters in any subject or developing codes and applications for your clients or managing a team of huge building projects. Unless and until you love it and master its art and strategy you won’t experience pleasantness in any work you are in charge of. The same goes while making relations with people. Your unwillingness and sometimes too much of friendliness might create a lull or havoc in relationships respectively. In short, your inability to tackle any work or relationship will obviously create a stressful atmosphere. The dimension that you choose when you work in any particular field is where stress comes into the picture. For instance, if you see developing applications in an IT industry as a responsibility (burden) just for the sake of bread and butter to your family then this would no doubt drown you down to stress. Because now your priority and love is not your work and you won’t show any interest in mastering it because of which there are high chances that you will fail the peer around you. But on the other hand, if you see this task as a project and that you need to deliver the best quality work for your client, you will not only ease at it but also advent new ways and ideas to ensure best deliverables. This then no more becomes a job but your love. Pay and perks then seem to be just flowing for you. Stress Management is an unsuitable title that has gained not-needed attention overseas. Stress can never be managed in literal terms. What you need to manage is your work and your priorities and everything will then be in order and will definitely pay off. Now there are times when you are put into situations where you have never imagined yourself to be in a lifetime or so. But then you have to take its onus. This is where stress comes into the picture. For instance, monitoring your efforts in the team as a developer and the ease with which you handle all your tasks you were promoted promptly. Now at such a young age, while managing a team or two pressures are likely to build up. This is where yoga comes into the picture, not to fight stress but to accomplish each and every unwelcomed task that crosses your path. This can be done only through the concentration and strategic power that builds up with time and not all of a sudden through Mind yoga. Mind yoga or meditation is widely proven to be one of the most effective ways of dealing with life. 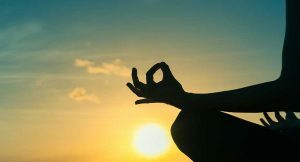 One should note that meditation is not just confined to building up your concentration level but in the time to come it rewards you with fruits people have never imagined to bore in such a beautiful way. Plant yourself aloof from all the noises and disturbances. Light an organic lamp in the room you are seated and let its dimness breeze in the room for a while. Sit upright in ” asana with your palms facing upwards and your head slightly tilted above. Try converging all your focus towards your brows and take deep breaths. Concentrate on a single thought with each breath you inhale and exhale. Most vividly since being meditative is to know your inner self you can repeat words like ‘ I am not the body’ with each inhalation and ‘I am not even the mind’ with each exhalation. Try concentrating on these two lines with each breath. Start being meditative for a few minutes in the beginning and then extend it to an hour daily. This is just an example of how to concentrate on one single thought at a time which our mind is not used to. This exercise even though it seems to be simple can yield incredible benefits in the time to come. Work now will never seem to be a burden but instead a cakewalk for you.